If you’re already dead or cool with becoming dead, then you will most certainly enjoy the assault on human life that is this Snollygoster expansion. This baby’s packed with new situations, strategies, and humor that individuals under the age of 57 may find shocking. Prepare for “Infected” players unleashing havoc upon their healthy crewmates, and a new Hidden Agenda hell bent on infecting as many players as possible. There’s also new Action and Event cards to deal out the pain and create some serious workplace drama. This expansion requires at least 3 - 4 players or 3 - 6 if you have the +2 Player expansion. Add the blue labeled cards to the Action deck, and add the yellow labeled cards to the Event deck. If you ever want to play without the NSFL cards, simply remove any cards with the NSFL symbol in the upper right corner. Deal every player a Medical Chart card. Place it “Healthy” side up near their Tag cards. Remove the Patient Zero Agenda from the Agenda deck. Shuffle the deck. Remove Agenda cards until the deck equals the number of people playing minus one. Add the Patient Zero Agenda to the deck. Shuffle again and deal out the Agenda cards. Someone will always have the Patient Zero Agenda. Their Agenda is to get as many infected players on the escape pod as possible. They’re neither a Comrade nor Rogue. They don’t start Infected. If they die before the game ends, they must reveal their Agenda, everyone becomes Healthy, and the Quarantine mechanic replaces Infection. Eat safe and unsafe food without consequence. If no food is available, they can opt to “eat” a Healthy player. The “eaten” player then becomes Infected as well. Draw three cards from the Event deck, pick one, and put the other two at the bottom of the deck. If there’s no food or Healthy players to eat, they starve. They can leave the planet, but it’ll feed points to Patient Zero. Likewise, other players are less likely to take them with. The game continues if everyone is infected. “End” and “Win” conditions remain the same. Denotes whether you’re Healthy or Infected. Place in front of a player. It remains on the table until a new Cripple card is played. That player draws one fewer card from the Event deck while the Cripple card is on the table. Remove any Cripple cards from the table when a new Cripple card is played. There can only be one Cripple Card on the table at a time. It can only be denied when it’s initially played. Name an Action card. Any player that has that card must give them all to you. After taking their cards, if your hand exceeds four, discard any cards until your hand no longer exceeds four. Privately look at a player’s Agenda card. Do not show their Agenda to anyone else. You may say what the Agenda is if you like, and you may also lie. Make an Infected player Healthy. Flip their Medical Chart “Healthy” side up. If there’s no one to Sterilize, discard it. Select a player. Everyone else must vote whether to kill this player or not. When everyone is ready to vote, all eyes must be closed. Those in favor of death must raise their hand. Then open your eyes and count the votes. 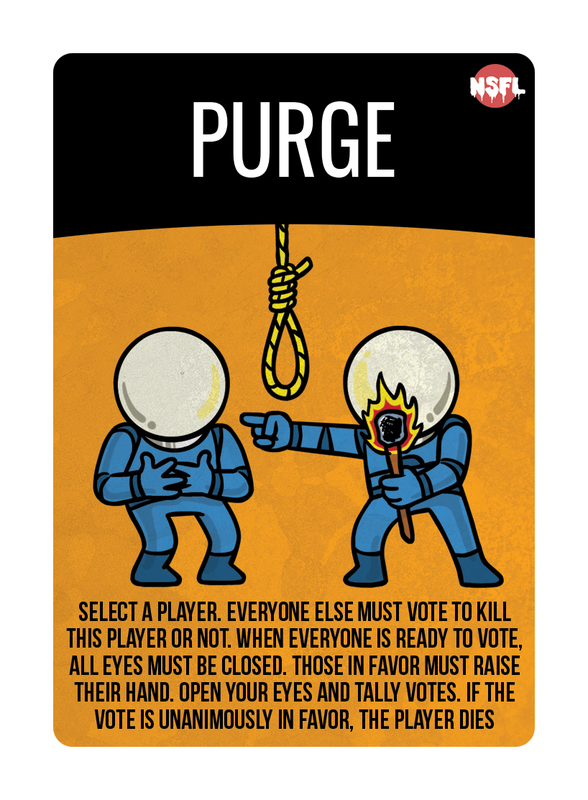 If everyone voted in favor of death, the player dies. Do not count the selected player in the vote.